The first Premier Company Plan is launched. A committee is established to discuss Canon development, production and sales systems. The Kosugi office opens as a base for optical equipment. Canon (U.K.) Ltd. is established. Canon enters the facsimile machine market. 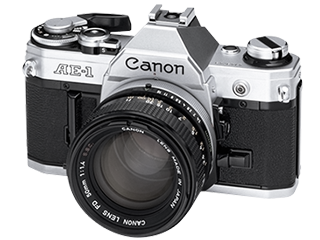 The AE-1 SLR camera with a built-in micro-computer is introduced, triggering an AE boom. The CR-45NM, the world's first nonmydriatic retinal camera, is introduced. 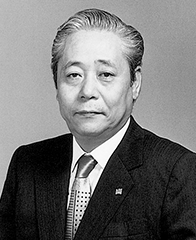 Ryuzaburo Kaku is appointed president of Canon Inc. The Utsunomiya plant of Tochigi Canon Inc. (today, Canon Inc.'s Utsunomiya Plant) opens. The K-35 series of lenses for cinematography wins an Academy Award from the U.S. Academy of Motion Picture Arts and Sciences. A product-specific business division structure is introduced. Canon Australia Pty. Ltd. is established. Canon begins offering color copying services. 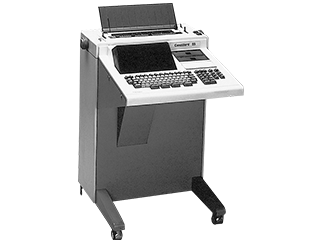 The NP-8500, the world's first retention-type copying machine, is introduced. The PLA-500FA, the world's first mask aligner with a laser-based automatic alignment system, is introduced. Copyer Co., Ltd. becomes an affiliated company. Canon Singapore Pte. Ltd. is established. Overseas sales exceed ¥100 billion for the first time. The LBP-10, using a semiconductor laser, is introduced. The AF35M, a fully automatic AF compact camera, is introduced. A mini floppy disk drive is introduced. The Canoword 55 Japanese-language word processor, the first such product with roman alphabet inputting, is introduced. The Telefax B-601, Japan's first G2 fax, is introduced. The Auto Ref R-1, an automatic refractometer, is introduced. The Hiratsuka Plant opens as the Component Development Center. The Ami Plant opens as a precision equipment factory for the manufacture of facsimiles and precision molds. The Ueno Plant opens as a copying machine and laser printer chemical product manufacturing factory. The NP-8500 SUPER, an ultrahigh-speed copying machine capable of producing 135 copies per minute, is introduced. The New F-1, a professional-use system SLR, is introduced. A CVC video system is introduced. The Second Premier Company Plan is launched. Oita Canon Inc. is established in Japan. The PC-10 and PC-20, the world's first personal copying machines with replaceable cartridges, are introduced. The HT-3000 handy terminal is introduced. The AS-100 16-bit personal computer is introduced. The AP400 and AP500 electronic typewriters (for Western languages) are introduced. The Crib-O-Gram, an audio-visual tester for infants, is introduced. Canon Bretagne S.A.S. is established in France. The Utsunomiya Optical Products Plant opens as a factory to manufacture mask aligners and peripheral equipment. The CanoWord Mini 5 personal-use word processor is introduced. The MyCard, credit card-sized calculator, is introduced. 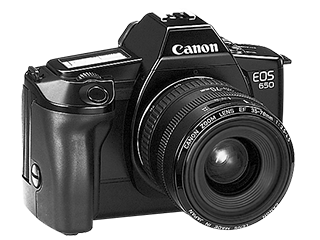 The T50 SLR camera is introduced and wins Japan's 1983 Good Design Grand Prize. A joint technology agreement is signed in the PRC; copying machine production starts at facilities in Zhanjiang and Tianjin. Canon Components, Inc. is established in Japan. The PC Printer 70 is introduced as the world's first plain-paper reader/printer for COM. 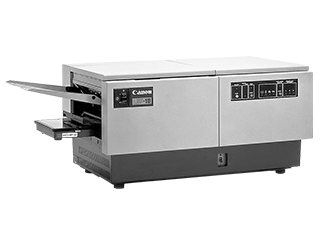 Canon announces laser beam facsimile machines. Practical tests of a still video camcorder are conducted at the Los Angeles Olympic Games. The digital laser copying machine system NP-9030 is introduced. The LBP-8/CX, the world's smallest and lightest laser printer, is introduced. The FPA-1500FA stepper for 1 MDRAM is introduced. The PV14 x 12.5B HD, a zoom lens for high-definition television, is announced. Canon Virginia, Inc., is established in the U.S.A.
A tie-up agreement related to computer technology is concluded with Hewlett-Packard Co. of the U.S.
Lotte Canon Co., Ltd. (today, Canon Korea Business Solutions Inc.), a joint venture, is established in the ROK. The BJ-80, the world's first inkjet printer using Bubble Jet technology, is introduced. The Canofile 5500 electronic filing system is introduced. The EZPS5300 electronic editing and printing system is introduced. The Canovision 8 VM-E1, an 8 mm video camcorder, is introduced. A tie-up agreement covering ISDN fax interface technology is concluded with Siemens AG of Germany. A tie-up agreement covering advanced medical equipment is concluded with Eastman Kodak Co. of the U.S. The FC-3 and FC-5 portable personal-use copying machines are introduced. The FAX L3100, conforming to the G4 standard, is introduced. The Canola BP1210-D, a Bubble Jet desktop calculator, is introduced. The T90 high-performance electronic SLR camera is introduced. The RC-701, the world's first still video camera, and video system is introduced. Sales begin for the Auto Keratometer RK-1, which can measure both refractivity and corneal shape. Canon’s Corner Cube Reflector is installed in the Ajisai geodetic satellite. The Canon Foundation is established to provide assistance for research into mutual understanding between Japan and Europe. Canon licenses camera technologies to GoldStar Precision of Korea, which begins production. 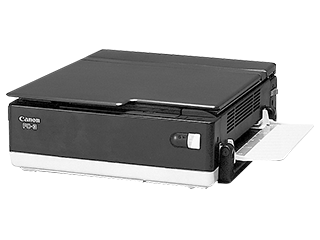 The CLC-1, a digital full-color copying machine, is introduced. The EOS autofocus SLR camera is introduced along with a range of EF lenses. The Board Copier A-1, an electronic blackboard that can print on plain paper, is introduced. Sales of the CanoWord α series Japanese word processor begin. Canon launches a broadcasting lens with 50x zoom, then the highest zoom ratio in the world. Sales of CAPLAS, a CAE software application for use in injection molding, commence.